1. Something insulting that makes a person shocked and angry: "The politicians were throwing so many affronts at each other, that many in the audience couldn't tolerate it any longer; so, they started to walk out." 2. An open or intentional offense, slight, or insult: "Karl's rejection of Mark's plan was a personal affront!" 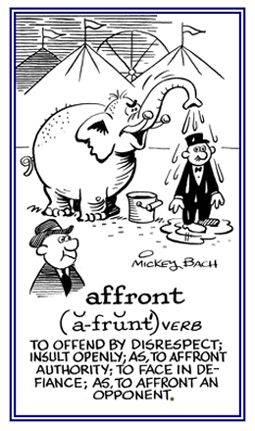 Affront came from Old French afronter, "to push someone's face in"
By the time affront came into English (about 1300) it simply meant to insult someone to his or her face and it was ultimately derived from Latin frons, "forehead"; which is also the basis of the words front and frontal. 1. To intentionally insult someone; especially, openly in order to cause displeasure, anger, and resentment: Don't affront the speaker by asking him such rude questions. 2. To do or to say something which shows a lack of respect or consideration for another person's feelings: The customer was affronted by the salesperson's rude behavior. 3. Making an obvious and intentional offense, slight, or insult: The supervisor affronted his employee by saying, "Your proposals have no practical value; so, don't make such suggestions again". Someone can insult another person in private; however, when anyone is affronted, it is done in public. 3. 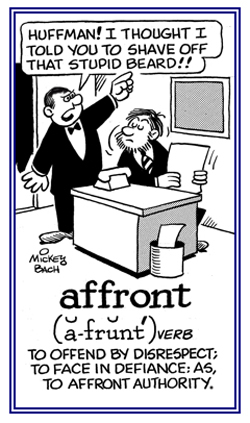 Etymology: fron Latin ad-, "to" + frons, "forehead"; originally "to confront a person face to face". © ALL rights are reserved.